In light of The Nature of Awareness (Part 1) we can add the following to this essay. (1) “Something” lies in the dimension of awareness. Therefore, beginning will coincide with beginning of awareness. Similarly, end will coincide with end of awareness. (2) This can be visualized on a universal scale. After end there is simply non-awareness. This non-awareness shall continue until something emerges into awareness. (3) Thus, the universe may go into non-awareness, and then return to awareness. This is the basic cycle of the universe. (4) We cannot define “nothing” in universal terms. There is simply non-awareness. (5) Thus, universe implies awareness. The universe is aware of itself. 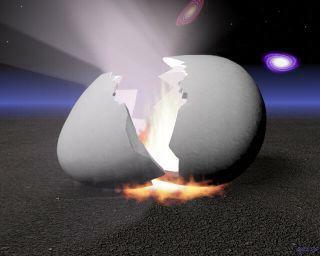 Scientists have been struggling with theories about the beginning of this universe. But there doesn’t seem to be much analysis carried out about the concept of BEGINNING itself. A beginning is essentially a beginning of “something”. The moment there is something, the rules of mathematics, physics, metaphysics, logic, etc. come into play. When there is nothing, no rules seem to apply. We can get an idea of the beginning of a day, the beginning of a city, the beginning of a meal, the beginning of life, or even the beginning of a universe. The common idea here is that of beginning. The idea of BEGINNING is accompanied by the idea of END. “Beginning-End” forms a pair. They give meaning to each other. If there is a beginning then there also must be an end. If there is an end then there also must be a beginning. BEGINNING and END together lead to the idea of CHANGE. From beginning to end there must be a change. Thus, we have BEGINNING – CHANGE – END. This has been referred to in ancient texts as a CYCLE. This cycle may be observed universally. A child is born. It grows to be an adult. It then grows old and dies. A project is conceived. It is then implemented. It then runs its course as it achieves its goals. Thus, it comes to an end. An era, such as the Industrial Age, comes about. Progress occurs. It then gives way to another era, such as the Information Age. Thus, an era comes to an end as a new era starts. The cycle of “Beginning – Change – End” is a universal phenomenon. The change from BEGINNING to the END can be observed in most things as being made up of successive events. After the END such events cease to exist, and no event starts until the next BEGINNING. Thus, by definition, no event exists after the end of one cycle and before the start of another. Thus, there is something and there is also nothing. So many beginnings and endings happening at the same time. Endless processes that intertwine. The measuring of motions in space is time. If there are many beginnings and endings at the same time then they all must exist within a larger cycle that defines the time. TIME is the key property of a cycle. TIME exists only within a cycle. From the viewpoint of Physics, a cycle may possibly start with a BIG BANG, and end with a BLACK HOLE. I look at “infinite potential” as a consideration. It may be valid, but I don’t know. Indeed. Beginning – middle – end. Each of these is an effort to stop / limit the process so it can be identified and inspected. A freeze frame. I have come to understand that knowledge / data derived from an inspection of a freeze frame must not be taken as truth other than within that freeze frame. It is an inherent flaw of freeze frame, that one is studying something that has been deliberately limited for the purpose of narrowing the scope of observation. And that freeze frame is a copy / abstraction of that which cannot be stopped. So one studies a copy. A frozen, limited, and stripped copy. (1) You study it as a whole. (2) You don’t have to stop a process at different points to study it. (3) Each point is in the present time. You study what something is in the present time. (4) “Beginning – change – end” is the property of any process, any step of process, an sub-step of process, and so on. (5) You don’t have to stop the process, etc., to observe and understand this property. Maria, I understand better now what you are talking about here. Studying a frame by freezing it narrows the context. This may lead to hypnotic influence as decribed in The Secret of Hypnotism. You grasp something totally only when you look at the whole thing from beginning to end all at once. Things appear, then they persist for some time, and then they disappear. This is actual observable phenomena. This is how it is. It may also occur when there is an effort to “freeze frame” a process in order to define parts of it. but that is not all of it. There is beginning, continuation, and also end, without any effort to stop anything. There is arising from nothing. There is continuous changing. And there is also the disappearance into nothing. The broader is the context, the less misunderstanding there is. This essay is now incorporated in The Nature of Awareness (Part 1).